The BP Oil Spill disaster has had a devastating effect on the animals of St. Bernard Parish. Dogs and cats by the scores are being surrendered to the St. Bernard Shelter by residents who can no longer afford to keep them or who have to move but cannot take their pets with them. The Shelter is overflowing with some wonderful animals who need new families to love. The crisis in the Gulf region is still very real. Humans are struggling to make up for lost income – and in some cases, lost livelihoods. And innocent dogs and cats are paying with their lives. For these animals, the road is particularly grim. Imagine suddenly being surrendered by the only family you’ve ever known. Your new home is a meager kennel and the only predictabilities are terrible loneliness and mind-numbing boredom. If you’re not quickly chosen for adoption , you’re slated to die. Please vote every day during the month of November – and help spread the word. It’s free. It’s easy. It’s important. 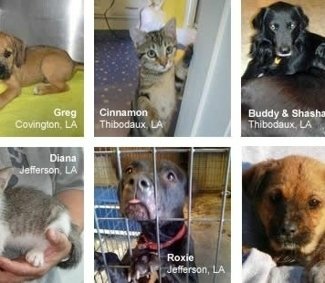 The dogs and cats of the Gulf region are not to blame for the tough times brought on by the BP oil spill. They certainly don’t deserve to die.